This installment of the Everyman Minis-series clocks in at 6 pages, 1 page front cover, 1 page editorial, 1.5 pages of SRD, leaving us with 2.5 pages of content, so let’s take a look! This pdf focuses on an underutilized component of character development – families should matter. All too often, there are no tangible benefits apart from kidnapping or tragic deaths for a character to have an extensive family. This is a huge component of untapped potential. 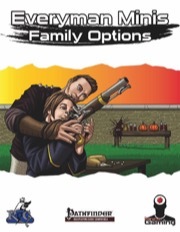 There is no AP that lets the players play a family-chronicle/enterprise, and we have very few options that interact with familial ties, apart from hereditary curses. This pdf seeks to somewhat change that. On the first page, we get a new spell that takes ACG and OA-classes into account, and this single spell is a game changer. It is a level 3/4 spell that is called blood bond, which may only be cast upon blood relatives and lets you target such a relative with personal spells. This makes e.g. brothers, where one is a spellcaster, the other a rogue or fighter, suddenly much more potent. It is a limited resource, but I love it to bits. The pdf also provides two new feats: Bound by Blood builds on Psychic Sensitivity or the ability to cast psychic spells. You can choose up to your highest mental ability score allies, using the psychic magic universal monster rule, to cast message, mindlink, sending and status, with PE-values noted. You have 5 + character level PE. If an ally has the teamwork feat, you reduce PE costs to cast the spell for that ally, and on a new level, you can swap a character. This is narrative gold and provides easy access to basic psychic tricks. Love it. Synchronized Assault is a combat teamwork feat, which nets you a circumstance bonus equal to the number of allies within 30 ft. that also possesses the feat when you readied an attack that is triggered. If the allies with the feat also have readied an attack, they may immediately trigger the readied actions after your attack is resolved. Now, I think that the bonus should have a level-based cap instead of just number of allies, but yeah, other than that, I like it. The pdf also features 4 precisely codified traits, and these deserve special mention, as they are meaningful regarding their benefits, and also have a teamwork component: We get a bonus to saves versus magical effects that works better if an ally also activates it. We get better aid another, a special, jumbled childhood language that is impossible to magically decipher (AMAZING!) and the option to fortify allies affected by mind-affecting effects via your faith. Excellent traits. The pdf also contains two magic items: The clock of whereabouts is a helicopter parent’s (or mastermind’s) wish come true: 12 hands can be attached, and when an individual puts the name on a hand, the clock will spin to show the preset occupation (like “At work”, “late”, “lost”, etc.) of the character. The second item is the adoption ring: Parents and child to be adopted prick their fingers, having a drop of blood congeal into a gemstone. The adopted kid may then use the change shape universal monster ability to assume the shape of the parents’ race. The benefits of this Disguise are properly codified, though there is a spell-reference not italicized. Interesting: Incompatible parents of different races and shapechanging parents are noted as well. I love this item and all the storytelling potential it has. Editing and formatting are very good on a formal and rules-language level, with only a missed italicization as a complaint here. Layout adheres to the 2-column b/w-standard and the artwork is nice. The pdf has no bookmarks, but needs none at this length. Matt Morris’ family options are genuinely amazing. The new spell is amazing and both feats are interesting and complex. The traits matter beyond numerical bonuses and offer player-agenda, and the magic items are interesting. This is a great pdf, and my only regret here is that it could have been longer. The topic, as mentioned, is one that hasn’t been addressed extensively. Anyways, this is a great little pdf, easily worth 5 stars + seal of approval. 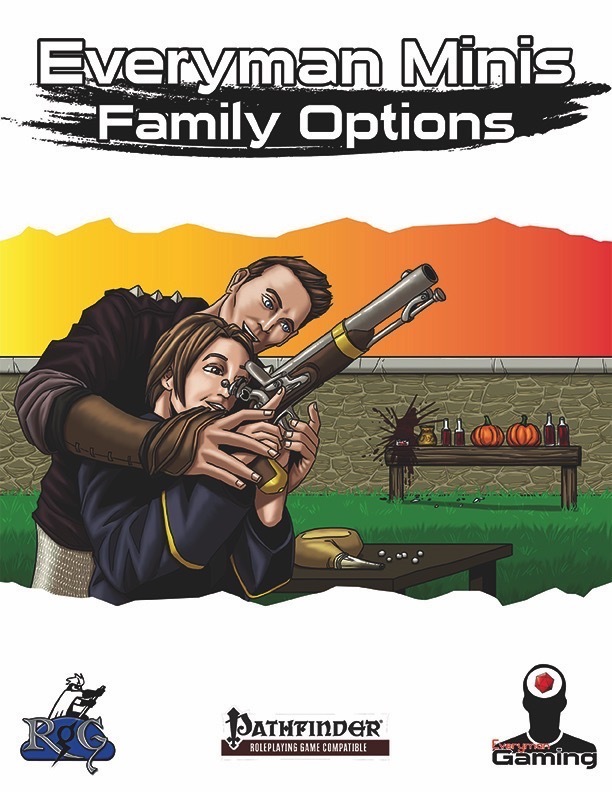 Gather your family both by blood and water to take advantage of Everyman Gaming's latest Pathfinder Mini, Everyman Minis: Family Options! Included within are new teamwork feats that rely on the bonds between siblings, new character traits that represent family bonds and trades, and even a new magic item for characters who find themselves adopted by foreigners—the adoption ring. I just like the idea of some options for people who don't come from unspeakably horrible families. Such have their place but they've been overused in fiction past the point of cliche and into sheer caricature. Thanks, End! We’re glad you enjoyed it.